FUNDING TO THE tune of €100,000 is being pumped into a programme of “rhododendron eradication” in Killarney National Park, but this funding has been described as “nowhere near enough” to fix the problem. In a tender launched yesterday, the Department of Culture, Heritage and the Gaeltacht said it was issuing a one-year contract for the management and implementation of a plan that would put an end to the problems caused by the invasive weed in the park. Rhododendrons form very dense thickets and out-compete native plants for space and resources and are listed as an invasive species in Ireland. The problem is particularly acute in Killarney National Park where almost a third of the 10,000 hectares in the park were affected at some stage. This latest funding comes as part of significant government investment to try to eradicate the problem, with €300,000 spent last year alone. Speaking to TheJournal.ie, however, Kerry independent TD Michael Healy-Rae said that while any investment to tackle the issue was welcome, this level is not near enough to fix the problem. “It’s worse now than it ever was, despite the work of many people to try to fix it,” he said. “It would take a lot more than that – it may take many multiples of that to eradicate the problem. It’s a very labour intensive procedure. There’s no quick fix. It’s back-breaking labour. In February, Minister for Culture, Heritage and the Gaeltacht Josepha Madigan told the Dáil that the ongoing programme to get rid of the rhododendrons would include this tender, follow-up work by contractors and on-going maintenance work by volunteers, students and NPWS staff. The invitation to tender also includes guidance on the recruitment of volunteers to help facilitate the aim of this eradication. “It is envisaged that volunteers will be best utilised via a short-term (ie, up to one month) project-based work camp arrangement but other longer term arrangements may be permitted where this does not place an undue burden on local management,” it said. Healy-Rae added that the difficulty of the work involved meant that a “massive effort” would be needed to fix the problem once and for all. Email “'Nowhere near enough': Healy-Rae reiterates army call as €100k funding to fight rhododendrons announced”. 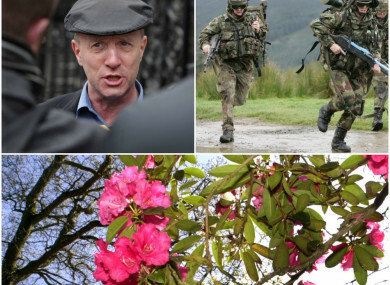 Feedback on “'Nowhere near enough': Healy-Rae reiterates army call as €100k funding to fight rhododendrons announced”.